Iconic stock images get a fashionable twist in this mock clothing collection from Adobe. Famous for their bland appearance, lack of soul and forced humour, old stock images are the bane of graphic designers and creative directors everywhere. 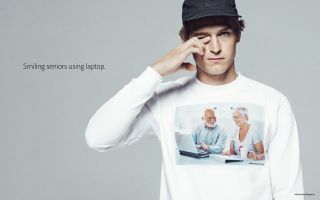 But even these tired assets are finding a new lease of life in a clothing collection from Adobe. Taking ironic clothing to the next level, the Adobe Stock Apparel collection was released to celebrate the recent launch of Adobe Stock's Premium Collection. With designs including 'laughing woman eating healthy vegetable salad', to 'firm handshake between business associates' gracing T-shirts and sweatshirts, Adobe hopes the clothing line will encourage creatives to leave worn out stock images behind and choose their premium assets instead. Who could forget smiling woman drawing red graph? The tongue-in-cheek clothing line is backed up by independent research from Pfeiffer Consulting, which found that hi-res images take an average of 287 seconds to license, whereas searching for premium images from Adobe Stock is 10 times faster. "Finding the right image for your work used to require hours of searching on stock photo websites,” said Richard Curtis, Principal Solutions Consultant, Digital imaging, Adobe UK. "With Adobe Stock, it’s now possible to search for over 55 million creative assets from directly within your Creative Cloud apps, helping creatives to spend less time hunting and more time creating amazing work."